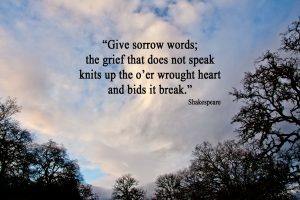 Bereavement Support South Worcestershire has been running since July 2012 and offers various types of bereavement support to anyone registered with a South Worcestershire GP. We are funded by South Worcestershire Clinical Commissioning Group and hosted by St Richard’s Hospice. We offer bereavement counselling to individuals and couples, group work and telephone support to bereaved adults, as well as individual and group support to children, young people and their families. In addition, we can offer practical advice and signposting. We offer support for any type of bereavement, but we very often work with individuals and families who have experienced traumatic and unexpected loss e.g. suicide, road traffic collisions, death from cardiac arrest, accidental death, multiple loss, etc. Our friendly and professional team is made up of three counsellors trained to work with adult grief and loss, and a child and family support practitioner experienced in supporting children, young people and their families with their bereavement. Referrals into the service can be made by the bereaved individual(s), their GP, other health professional and additionally (in the case of individuals under the age of 18) by a parent or guardian or adult family member. We are part of the Family Support Team at St Richard’s Hospice and sessions take place in light, modern and comfortable rooms at the Hospice. Children and young people may be seen at school or college if appropriate.